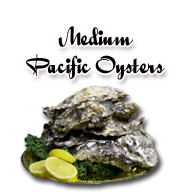 Wild pacific oysters, Great for barbeques, pan fried, in favorite stews or chowder. Delicious mild flavor, and excellent served with a glass of wine. 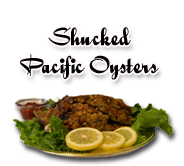 Straight from the pristine waters of the Pacific Ocean are our Fresh Pacific Oysters. These Pacific Oysters are perfect for the barbeque; just add a little garlic and butter and you have the perfect entrée to serve family and friends. Pacific Oysters arrive alive and ready to be cooked and enjoyed by all. 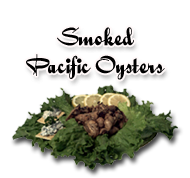 Our Pacific Oysters are the perfect addition to any steak barbeque as the classic side dish. Impress your friends with Pacific Oysters and give them the experience of being on the coast without leaving your backyard. As a fresh seafood gift basket supplier we ship fresh and frozen seafood gift baskets worldwide. 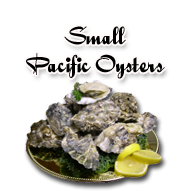 Seafood Inc is dedicated to superior quality of its frozen and fresh seafood gift baskets.